Perennial. Zone 6, possibly colder. Nyctaginaceae. A.k.a. Heart-Leaved Four-O’Clock, Umbrellawort. Native to the Great Plains of the United States, as well as southern regions of Manitoba, Saskatchewan and Ontario. Isolated introduced populations found throughout B.C., Alberta and Quebec. On a recent road trip, heading through the arid rangelands and rolling hills south of Cache Creek and following the Thompson River’s deeply carved valley as it heads towards its spectacular rendezvous with the Fraser at Lytton, my attention was caught by several tall clumps of lush, dark green foliage, showing clusters of small but vivid magenta-pink blooms. Pulling over in a wide spot on the road, I looped back to take a closer look. An initial examination of the flower structure and foliage gave me an “Aha!” moment. Could this possibly be wild four-o’clocks? It wasn’t in any of the wildflower field guides I had along, nor, when back home, in my trusty and comprehensive Lewis J. Clark’s Wild Flowers of British Columbia, but an internet search yielded an immediate confirmation. My online research yielded these details. 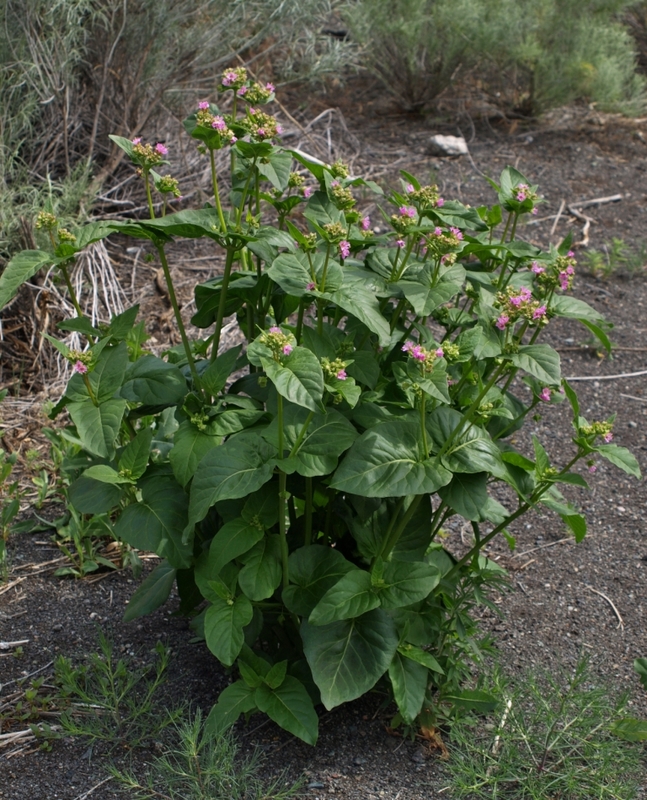 The plants grow in vigorous clumps from 1 to 3 feet tall (these were about 2 feet tall), with broad, heart-shaped, opposite leaves clasping the angle-sided stems. 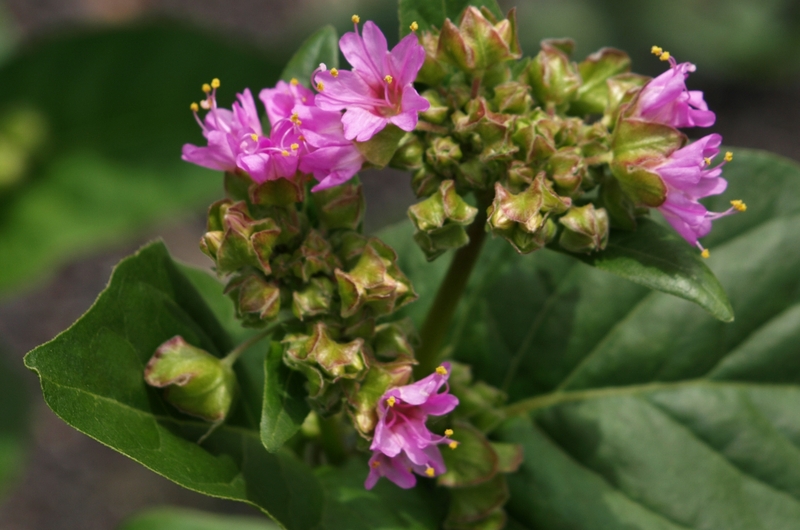 Flower clusters show green bracts at the bases of the tubular flowers, which are of a bright magenta pink. Stamens are also magenta, tipped with yellow pollen. After flowering, the bracts enlarge into a papery “umbrella” centered by a cluster of large, rather hairy nutlet-type seed. These bracts then act as parachutes during the seed dispersion stage. The sweet-tasting roots of this plant were used by indigenous peoples as a poultice for skin ailments and burns, and as a medicinal tea to expel worms, and to treat fevers and bladder complaints. 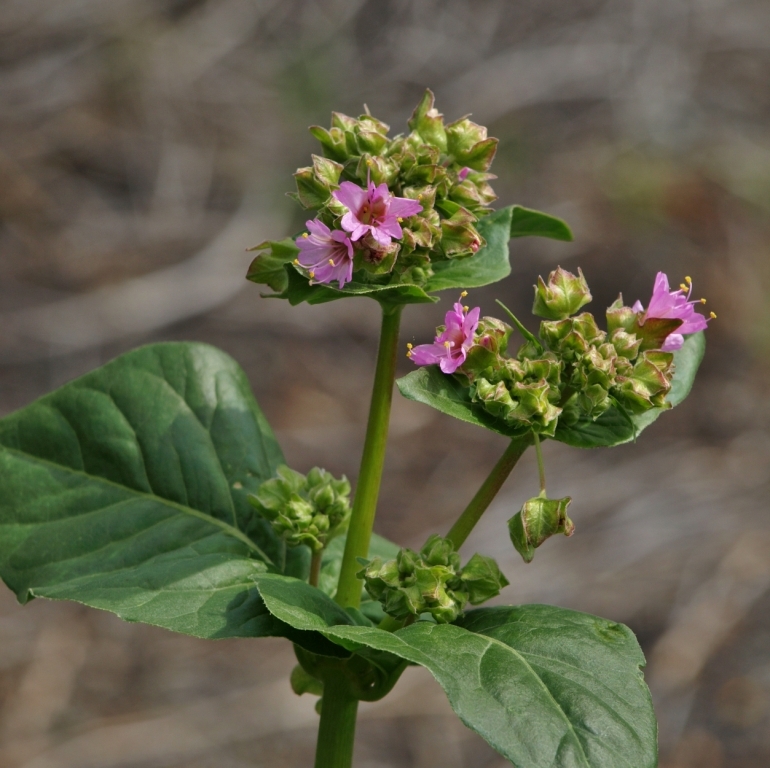 Though pigs apparently dig up and eat the roots with great relish – they are recommended for eradication in agricultural infestations – there is some speculation that Mirabilis nyctaginea may contain some mildly toxic alkaloids, so experimentation with herbal use is not advised. I suspect that this plant would not be winter hardy in the Cariboo-Chilcotin, but it might well succeed as an annual, as its domestic relative, the lovely and fragrant Mirabilis jalapa (the commonly grown garden flower Four-O’Clocks, or Marvel-of-Peru) blooms generously as a summer-flowering annual, and forms a similar fleshy root which does not withstand freezing soil. While decidedly pretty in a low-key way, Mirabilis nyctaginea is not particularly showy, and reports of its “weedy” tendencies would make me cautious to recommend this plant, though it might be an interesting addition to a wildflower planting if one is feeling adventurous, and is prepared to remove seedheads before they can disperse. Seed is often available for this plant through botanical seed exchanges, and commercially through some specialist native plant seed houses.